First things first, the campaigns of WWI are not very familiar to me. This book covers, what I originally thought, a very obscure battle of the Japanese attack on German Tsingtau in the Pacific (current day Qingdao). Although the name 'World War One' implies a global conflict my naive understanding is limited to the Somme, Verdun, Gallipoli et al. It should be no surprise that the colonial subjects across the Pacific were drawn into the war just as their primary state decreed. The book starts with several chapters that detail the geo-political environment of all the main belligerents. In these formative chapters there is a large reliance on direct quotes from source material. This leads to some dense sentence construction, of which the author excels throughout the rest of the book, even when source material is not being referenced. In the introduction to the book, the author himself states that if you want to get to the actual fighting, i.e. to skip the politics, then skip the first couple of chapters. I might be doing the book an injustice, there are a few skirmishes in the previous chapters, but the actual battle, from my understanding started in Chapter 7, the penultimate chapter of the book. Again in the introduction, the author states that the book is not aimed at the academic audience. I think he is doing himself a disservice as the book is, to my mind, thoroughly researched and includes 66 pages of notes and bibliography to the 8 chapters, that comprise nearly 40% of the book. Any student of the theatre, at any level, would do well to pick up this book and read this narrative history of the battle. All that being said, I was continually surprised by this account of an 'obscure' battle. I wasn't aware of the extent of German colonisation in the Pacific, nor the different military's nascent air power capabilities. However what initially piqued my interest with this book was the fact that two infamous WWII allies were, adversaries just 25 years earlier. I personally would have liked to see more analysis of how that came to be, but that is unfair to the author and his work, as that would warrant an entirely different book outside this scope. The book includes the standard middle glossy insert of photo pages. The scale and size of the equipment shown in these photos somehow seemed incongruous to the text I was reading. This is no criticism of the text rather a new-found admiration and awe of the bravery of soldiers from both sides, with the most rudimentary of equipment, going against massive siege artillery. I particularly enjoyed the account of SMS Emden's (a German light crusier) exploits in the Indian Ocean against the Entente Powers' shipping. A nugget I will take away from that account is the importance of logistics and command and control (C2) support; often decried as boring and glossed over in many historical war-games, yet it is essential. The German East Asian (naval) Squadron was bereft of a re-supply base and had to split into both the Indian Ocean and round Cape Horn into the Southern Atlantic to find fuel and repairs. As a precursor to the battle the British and Japanese forces destroyed the radio masts of the German occupiers. This, I imagine, is still employed today as a viable military tactic i.e. denying the enemy C2 channels, but in 1914 the German colony was left with no communication ability to the outside world. From a modern perspective that seems scary and almost impossible to achieve today. The other aspect, which I found noteworthy, was the effect and experience of aeroplanes in this battle. The author, at some length, explains a few of the aviation firsts that occurred during and in the events preceding this battle. I was very grateful for the detail he included and I would have liked another chapter or so dedicated to the air environment. The author loosely follows the exploits of a couple of pilots from both sides as they built, and fixed their aircraft to fly reconnaissance or strike missions. Yes you read that right - 'strike' missions. I was particularly intrigued with a pilot who was given his license, his 'wings' if you will, after 2 days training and how his propeller would disintegrate during flight as the right type of glue wasn't available! I can't imagine flying in a self-destructing aircraft. Overall this book opened my eyes to the global scale and scope of WWI and I am grateful to have read it. My personal experience and interests include military aviation and the pacific theatre from WWII to today and so this book was interesting to me. I couldn't recommend it to the casual reader unless they have, at the very least, a peripheral interest in the topic. However, if you are in the latter camp then pick it up and you may be as surprised as I was. 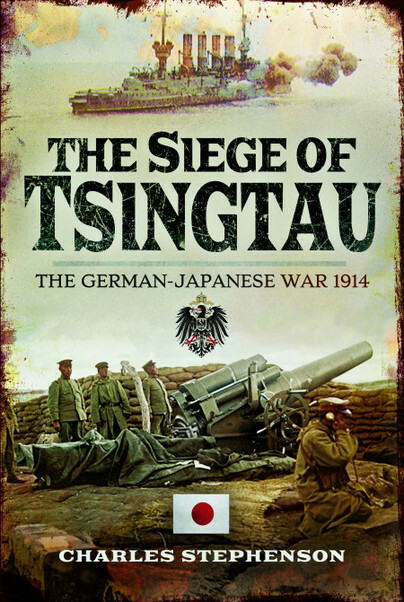 The Siege of Tsintau is available from Pen & Sword Books for £20.